Small rock bands and performers that are unable to fill stadiums can forget about touring in Russia. If the State Duma adopts Alexei Mitrofanov's bill that forces concert promoters to get a special license and a $5-million bank guarantee, small promoters will be ruined, and tickets to major shows will be even more costly. A bill introduced earlier this month to the Russian State Duma to oblige concert organizers to obtain a special license and a 150-million-ruble ($4.9 million) bank guarantee has caused a commotion in the concert market. The idea of licensing concert promoters is not new. It is also not hard to see where the legislators are coming from — a huge growing market, estimated at about $1 billion, yet barely regulated. Cash is commonly the order of day (no taxes), and the field is home to dozens of unregistered players. The new law would effectively destroy the market, but with no real increase in tax receipts. Licensing the concert market was first recommended back in 2002 by singer and Duma deputy Iosif Kobzon — the most influential figure in Soviet and post-Soviet light entertainer. He proposed delegating responsibility to the Ministry of Culture, in an attempt to bring show-business revenue out of the shadows. The bill was discussed half-heartedly until 2008, but no one could agree on a so-called advisory council to issue licenses or come up with a clear-cut definition of "concert venue" and "professional artist." The subject was shelved, but clearly not closed. Market participants themselves are ambiguous about licensing. For example, Vladimir Zubitsky, president of Russian Show Center (Russia's biggest promoter, which has organized tours for U2, Leonard Cohen, and others), acknowledges that any licensing scheme is prone to corruption. Nevertheless, Zubitsky sees something positive in the latest parliamentary initiative. "If applied properly, it could help preserve our market and rid it of disreputable promoters," he says. Smaller promoters argue that the introduction of licensing and bank guarantees will lead to market monopolization. "It will impoverish the capital's cultural life and completely destroy it in the regions," says Pavel Kamakin, the art director of the popular 16 Tons rock club in Moscow, which often features foreign artists. "There will be no small clubs or young musicians." "The difference between the Russian market and those overseas is the absence of large multi-profile players," says Elena Krylova, an analyst at iKS-Consulting. In America, for example, the lion's share of the concert market (worth over $9 billion) is controlled by the promotion company Live Nation Entertainment (LNE; it also leads the e-ticketing market). This still does not prevent LNE from arranging events of all sizes — from intimate venues to stadiums. There is no trace of anything like that in Russia. 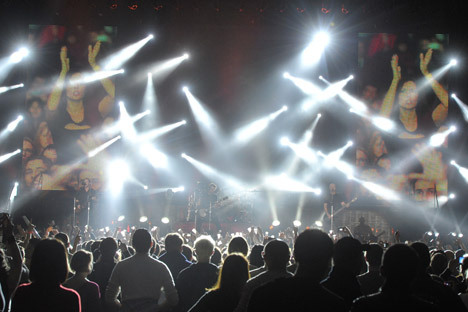 The report "Concert Market in Russia 2011," prepared by iKS-Consulting, highlighted that a vast array of companies (about 1,300) and individual entrepreneurs have a hand in organizing concerts. "The largest of them, Moscow State Academic Philharmonic, makes up about one percent of all concerts," says Krylova. It should be noted that the Russian provinces do not lag far behind Moscow and St. Petersburg in terms of number of concerts: of more than 100,000 such events held throughout the year, about 90,000 take place in the regions. However, concert revenue is concentrated in the two capitals: Moscow accounts for 35 percent of total revenue and St. Petersburg 17 percent, with just under a half (48 percent) for the rest of the country. Market participants are perplexed by the idea of new laws to restrict concert activity. "The market has long regulated itself," says Dmitry Reznichenko, CEO of regional concert agency MIR. "We don't need protection from ticket touting — that's a thing of the past. All venues work with a circle of proven people. And even if they did agree to cooperate with a newcomer, they'd never put him in charge of the booking office." Moreover, concerts are often organized by the artists themselves, and promoters are just remunerated for providing assistance. "So, if the law is intended to protect artists, it will protect them from themselves," says Reznichenko. The only intelligible motive for the state to interfere in this business would be to raise tax receipts — a move of which the bill makes no mention. Meanwhile, the concert market, which experts expect to be worth more than $1.3 billion by 2016, is populated by dozens of unregistered companies. Those that are known to the taxman either make do without formal contracts or deliberately understate the sums involved. "But legislation already exists to tackle the problem in the tax, administrative, and criminal codes," says Kamakin. Wracking their brains as to how the state could possibly be of assistance to the concert business, promoters note that Russia has no simplified system catering to Western artists. In most Russian cities, concerts are impossible to organize simply because there are no decent sites. Sports facilities are available to rent, but only if there are no scheduled events. "In Rostov-on-Don, a city of a million people, the largest venue houses 900 people," says Reznichenko. "Krasnodar, however, does boast a basketball arena for 6,000 spectators — but you have to find a window in the game schedule." First published in Russian in the Kommersant-Dengi magazine.